Tenants should not be compelled to lease the land they are occupying President Museveni has said. The President said forcing the tenants to take out leases would contravene the Constitution and the Land Act. “According to these laws, there is no evicting a tenant from land, no forcing him to lease. If the tenant wants, let him ask for the lease, if he does not want, he remains on the land. No one should chase him,” President Museveni, who was speaking in Zirobwe in Luweero District during Heroes Day celebrations on Friday, said. In April, Buganda Kingdom in central Uganda suggested that tenants on the kingdom’s land should regularise their tenancy by registering for 49-year lease titles. The kingdom said that would provide the tenants with security of tenure. Many tenants are already paying ground rent (busuulu), which was for long at Shs1,000 per acre annually. However, some landlords said the Shs1,000 was little. The rate would later be revised to Shs5,000 but many landlords reject even this. Using imagery, President Museveni said the Shs1,000 or Shs5,000 should not be an issue. “Soldiers salute me. But how much money is a salute worth? The salute merely means they [soldiers] respect me. There is no money from the salute,” Museveni said. He said many people who had contributed to the National Resistance Army (NRA) rebellion against the Obote II government are being evicted from land, something he cannot allow. Uganda has four land tenure systems: customary, freehold, mailo and leasehold. Customary land ownership is characterised applying local customary regulation and management to individual and household ownership whereas freehold ownership involves the holding of registered land in perpetuity or for a period less than perpetuity which may be fixed by a condition. Mailo landownership involves the holding of registered land in perpetuity. It also permits the separation of ownership of land from the ownership of developments on land made by a lawful or bona fide occupant. Leasehold tenure is a form of tenure under the landlord or lessor, grants or is deemed to have granted another person, namely the tenant or lessee, exclusive possession of land usually but not necessarily for a period defined, directly or indirectly, by reference to a specific date of commencement and a specific date of ending. President Museveni in December appointed established a commission of inquiry into land issues in Uganda. It followed on the heels of reports of land wrangles. 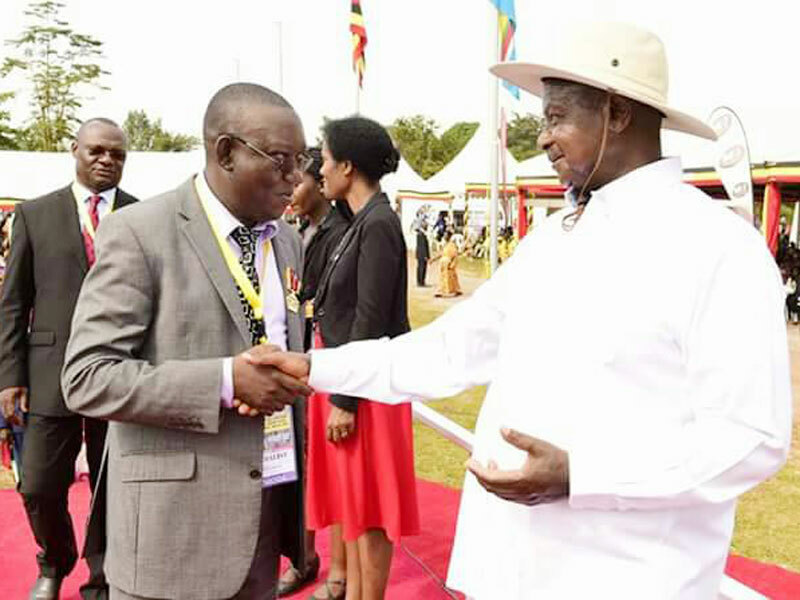 MP Kato Lubwama greets Museveni after his award of a heroes medal on Friday.